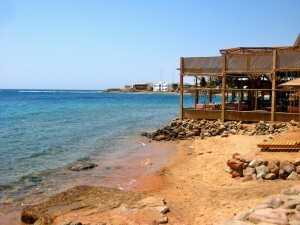 Dahab, as you may know, suffered a terrorist attack in 2006 and has since then bounced back, but has been recently overshadowed a bit by its neighbor, Sharm El-Sheikh. This is partly due to the fact that Easy Jet now flies to Sharm from most major UK airports and the hotels and restaurants have become bigger, cheaper, and more accessible (but not better!). We were warned about the scams in Egypt, they were supposedly much worse than the rest of the Middle East. Boy, did we feel it! Everything was an effort! This was the start of a very long battle between paying what was right and paying what we were told. Fortunately, We got away with not paying and the next day we were more prepared for the battle of prices. We woke up the next morning and rented our snorkel gear… off to the Blue Hole! This was my first time snorkeling and it was unbelievable. I can’t even explain… the Red Sea was simply fantastic. The water was crystal clear, blue, warm, and full of life! Dahab impressed us and before heading off for our 16-hour bus ride to Luxor we stopped at an Indian restaurant and had a delicious samosa wrap with fresh strawberry juice!